Andy: Heaven Hill has a nice fruity flavor. You can taste a definite hint of orange. 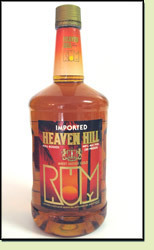 This is a good choice for an inexpensive rum. I believe my wife found this for $14 for a 1.75 liter bottle. I was definitely concerned when I saw that it was in a plastic bottle, which is usually a bad sign, but really, not bad. Adrian: This is a decent low cost rum. I wouldn’t drink it straight, but mixed with Coke Zero, I could drink it all night long.